Facts about Polish Lowland Sheepdogs, "Scientific name for Polish Lowland Sheepdog, or domestic canine, is Canis lupus familiaris". The Polish Lowland Sheepdog the long-haired medium-sized dog is also known the Polish Owczarek Nizinny. In the Poland and the United States, the Polish Lowland Sheepdod breed is simply known as the PON. After World War II the PON almost went extinct, they made a big comeback between the 1950s to the 60s. The Polish Lowland Sheepdog are most popular in there native Poland. It used to work on the lowland plains. It evolved from herding dogs which were native to Polland. The dog was as a result of cross-breeding between the mountain herder breed and shaggy herders like the Dutch Schapendoes and the Scottish Bearded Collie. Some of its varieties also have been as a cross between the Lhasa Apso and the Tibetan terrier. The dog is popular in Poland and other countries. A Polish Lowland Sheepdog is an omnivore, (definition-they eat both other animals and plants). All Dogs are direct descendants of wolves. 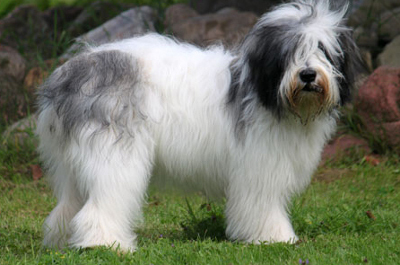 The Polish Lowland Sheepdog is a shaggy medium-sized working dog with a fairly broad leveled back. The average height of the Polish Lowland Sheepdog is 16 to 20 inches (40.6 to 50.8 cm). The average weight is 30 to 36 pounds (13.6 to 16.3 kg). It has a well masculine body with broad thighs and lions. Its head is slightly dome-shaped and broad. The dog heart-shaped ears are set moderately above the head. Polish Lowland Sheepdog has either a natural, short docked tail or a bobtail. The color of its eyes can be brown or hazel and with a dark nose. The Polish Lowland Sheepdog has a soft under layer coat with a wire- haired above and several hairs on its cheeks, forehead, chin and legs. Polish Lowland Sheepdogs coat can be in several different colors including, the common plain gray, permitted white with black or gray colors. The number one heath problems amongst Polish Lowland Sheepdogs is obesity, so always make sure your dog doesn't get to fat. Many foot problems that Polish Lowland Sheepdogs have are just an issue of long toenails. The Polish Lowland Sheep dog can be prone to health problems such as (PRA) Progressive retinal atrophy and Canine hip dysplasia. The Polish Lowland Sheepdog is a happy, clever active dog which is alert and has great memory. It is intelligent, obedient and affectionate. However, it remains watchful and reserved in the presence of strangers and can easily bite when provoked. It learns instruction very fast. The Polish Lowland Sheepdog is sociable and can make a great traveling companion. The Polish Lowland Sheepdog does better in a cooler weather climate, it can live in warmer weather, but it needs a place to cool off because of its long hair and the origin. The Polish Lowland Sheepdog can live in an apartment with lots of walks, but it will do better with a big fenced in back yard, on a farm or a country house with lots of land. Polish Lowland Sheepdogs sweat glands are between their paw pads. The Polish Lowland Sheepdog is not suited for city life. However, it can do well in apartments with regular exercise. It also requires to be stimulated by joining agility classes or playing an active game of Frisbee or catch. The Polish Lowland Sheep dog has a life expectancy of approximately 12 to 15 years. If purchasing a Polish Lowland Sheepdog from a breeder, make sure to find a good breeder with references check at least two to three of the puppies that were purchased from this breeder. The Polish Lowland Sheepdog belongs to the Herding Group and in 2001 it was recognized (AKC) American Kennel Club. A Polish Lowland Sheepdog’s mouth can apply approximately 150 to 200 pounds of pressure per square inch and an American Pit Bull Terrier, German Shepherd Dog and a rottweiler can have 320 LBS of pressure on avg. A Polish Lowland Sheepdogs can hear a sound at four times the distance of a human. Sound frequency is measured in Hertz (Hz) Def-Hertz is the measurement of frequency, explicitly it's one cycle per second. The higher the Hertz are, the higher the pitched the sound is. Dogs hear best at 45,000 Hz to 65,000 Hz, while humans hear best at around 20 Hz to 20,000 Hz. Only humans and dogs have prostates, But a dog doesn't have an appendix. Polish Lowland Sheepdogs have two times the amount of ear muscles than people. Polish Lowland Sheepdog’s nose prints can be used to identify them, their nose prints are like a humans finger print. A Polish Lowland Sheepdog smells more than 1,000 times stronger than that of a human. A Polish Lowland Sheepdog’s nose, secretes a thin layer of mucous that helps it absorb scent, after that they lick their noses and sample the scent through their mouth. Polish Lowland Sheepdogs pant to keep cool with 10 to 35 breaths per minute with an average of 24 breaths per minute. A large dog breed resting heart beats between 60 to 100 times per minute, and a small dog breed’s heart beats on average between 100 to 140 pant a lot. The fear of a dog (Cynophobia).